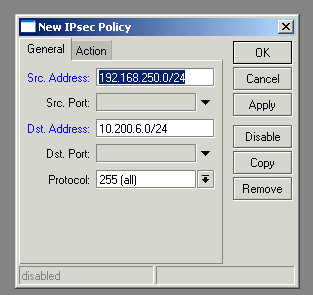 It’s unfortunate that the Mikrotik RouterOS manual on IPsec is not great – it’s sorely lacking in details and good examples, and what examples it does have are not well explained. 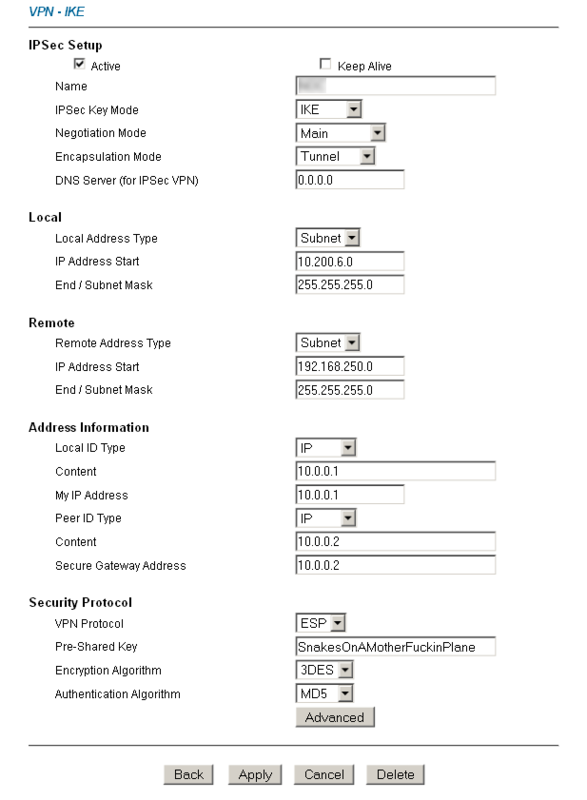 Recently I had to setup several Mikrotik RouterOS to ZyXEL VPNs and through I would document how it’s done. First, a quick diagram to explain the setup we’re going to cover. Just imagine that the 10.0.0.0/24 network in the middle is in fact the internet. We’ll configure the ZyXEL’s “public” address as 10.0.0.1 and the RB’s as 10.0.0.2. There’s a few confusing extras here that don’t appear on the ZyXEL. Proposal Check – Determines how proposed lifetimes are handled. Setting this to “Obey” is the most flexible as it will make RouterOS conform to whatever the remote site proposes. Note: I was not able to get group 2 to work. It results in a proposal mis-match error. Generate Policy – Appears to dynamically generate the policies depending on what details have been supplied by the remote side. 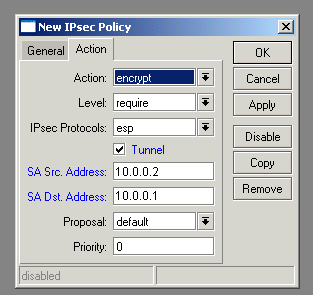 May be of use for dynamic VPNs. Lifebytes – Session will be reconnected after X bytes have been encrypted. Best to leave this alone. DPD – Mikrotik do not offer any explanation for this, other than that experiments on the official forums seem to confirm that it only appears works with other RouterOS devices. Juniper’s documentation explains that it stands for “Dead Peer Detection”. By placing this rule at the top of the NAT table under IP->Firewall, when a packet is directed from the RouterOS LAN towards the VPN destination subnet, the “accept” action will cause the NAT table to stop processing, and thus never reach any other NAT rules. There is no way to force RouterOS to establish the connection other than by sending traffic.It’s also important to note that v4.0 of RouterOS appears to suffer from a bug that causes the VPN to establish but not correctly route traffic across it. I connected Cyberguard SG300 with mikrotik router. This blog was very useful. Thankyou very much! This was very helpful. Good one especially the last step on NAT bypass rule! Hi, I’m trying to connect from Watchguard x20ew to Zyxel P2612. I wonder, where did you get the IP Address you placed in ADDRESS INFORMATION? I am confused what to enter there. thanks. Ow.. kindly disregard my last comment. I read it carefully and realized that it was their Public IP Addresses.